Alan Fitzgerald (1st year WIT Architecture student) and Ema Lemon. Photo credit: Keith Currams. 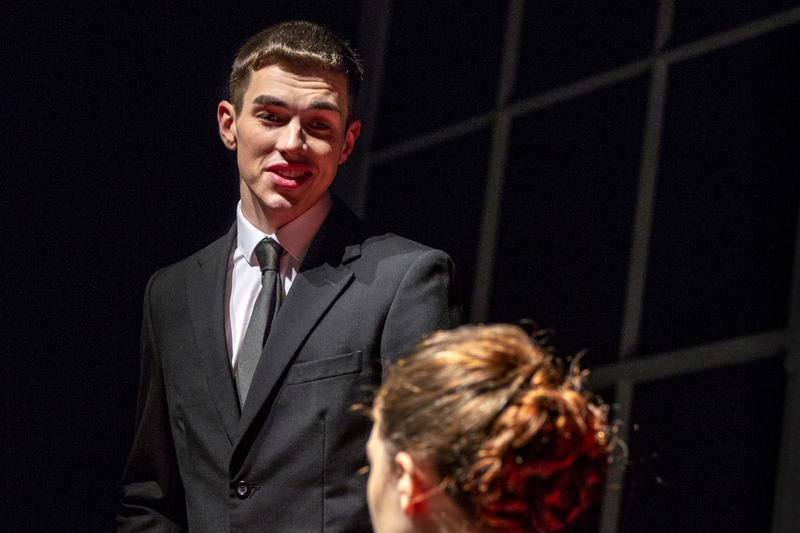 Music, Design, Architecture and Theatre Studies students at WIT are cutting their teeth in the world of theatre with a WIT/Garter Lane co-production of Mount Prospect by Una Troy. Mount Prospect reveals the character of a destructive widow who uses her husband’s will to advance her own son over two children from his first marriage. This is the first production in eight decades of the play which premiered at the Abbey Theatre in 1940 and is adapted from the novel of the same name. A savage critique of class prejudice and the position of unmarried women in 1930’s Ireland, Mount Prospect will be directed by Arts Council Theatre Artist in Residence at Garter Lane, Jim Nolan, with Set, Sound and Graphic Design from students of the School of Humanities and Department of Architecture at WIT. Student involvement include designs for set, sound and graphic design, which has been used for Mount Prospect's poster, flyer and online presence. Three of the cast are also WIT students and graduates; Megan Kelly and Laura Broderick are graduates of the Theatre Studies course (Bachelor of Arts (Hons)) and Alan Fitzgerald is a first year WIT Bachelor of Architecture (Hons) student. “Coursework included poster design, set design and model box creation and sound design, these intrinsic elements are integral to the creation of an authentic theatre production experience and students across all the involved humanities departments responded and embraced the project with enthusiasm,” says Síle Penkert Executive Director, Garter Lane Arts Centre. The winners of the WIT and Garter Lane, Mount Prospect student set design competition were Bachelor of Architecture 4th year students, Wojtek Cymerys and Helene Fabbri, with runners -up Bachelor of Architecture 4th year students, Rose O'Hare and Aisling Finn. The winning architecture students have worked with Garter Lane Arts Centre, their Theatre Artist in Residence, director and playwright Jim Nolan, and set designer Ben Hennessey to further design develop and construct the winning set design over the last few months for the upcoming production of Mount Prospect. According to Lecturer in Music Technology Mark Graham the WIT/Garter Lane collaboration has provided invaluable experience to BA (Hons) in Music students since its inception in 2014. “It affords students the opportunity to create sound designs for theatre in the most practical way possible, with industry mentoring and the opportunity for their work to be heard and used in a professional theatre production,” he said. “BA (Hons) in Music graduates have gone on to work with sound in theatre, television and film. That employment can be traced back to the experience gained from working on these projects with Garter Lane and playwright Jim Nolan,” he added. Waterford Music student Emmelle Wadding describes the collaboration on Mount Prospect as one of the highlights of her degree. “The collaboration married the analytical aspects of academic work with necessary real world skills of working in the theatre, gaining a well-rounded understanding of what will be required for future possible job opportunities in the field,” she said. Una Troy is also one of the subjects of a current research project entitled Performing the Region: Performing Women which focuses on how women playwrights in Ireland throughout the twentieth century articulated women’s lived experience and experimented with theatrical form. Following its previous and highly acclaimed collaborations on Blackwater Angel by Jim Nolan (2014) and Wife to James Whelan by Teresa Deevy (2016), Garter Lane Arts Centre and WIT return to the stage in November with the first production in eight decades of Mount Prospect by Una Troy. Premiered at the Abbey Theatre in 1940 and adapted from the novel of the same name, Mount Prospect reveals the character of a destructive widow who uses her husband’s will to advance her own son over two children from his first marriage. A savage critique of class prejudice and the position of unmarried women in 1930’s Ireland, Mount Prospect will be directed by Arts Council Theatre Artist in Residence at Garter Lane, Jim Nolan, with Set, Sound and Graphic Design from students of the School of Humanities at WIT. Una Troy was born in 1910 in Fermoy, Co Cork. She began her writing career under the name of Elizabeth Connor, and her novels from this period are Mount Prospect (1936) which was banned in Ireland; and Dead Star’s Light (Methuen, 1938). In 1940 she adapted Mount Prospect for the stage, winning the Shaw Prize from the Abbey Theatre, Dublin, where it was successfully produced. She continued to write for the Abbey Theatre, producing three more plays: Swans and Geese (1941), Apple A Day (1942), and Dark Road (194. Her novel We Are Seven was adapted as the film She Didn’t Say No and premiered in 1958. The film, with Waterford’s Anna Manahan in the leading role was England’s official entry in the Brussels World Film Festival and was banned in Ireland. Beginning in the mid-fifties she published all her work as Una Troy, producing fifteen novels, published in both London and America. Although born in Fermoy, Una Troy has strong Waterford connections. The family summered for many years in Bonmahon, where Una met Dr. Joseph C. Walsh whom she married in 1931. Following Dr. Walsh’s death in 1969, Una moved to the summer home in Bonmahon, living there until her death in 1993.